Powers/Abilities: Goran had likely passed through the Terrigen Mists, but his powers remain unrevealed. 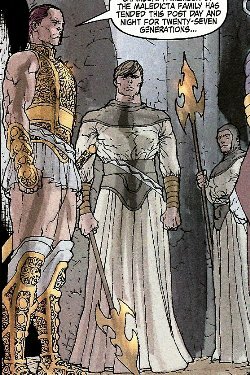 (Son of M#2 (fb) - BTS) - As they had for millennia through family tradition, the Maledicta brothers guarded the cavern which contained the Terrigen Crystals. The job was largely ceremonial and very boring as the Inhumans never ventured down there. (Son of M#2) - Quicksilver assaulted one of the Maledicta brothers and entered the Terrigen cavern. (Son of M#3) - Goran was assigned to trail Quicksilver throughout Attilan, to make sure the human wasn’t violating any Inhuman laws. 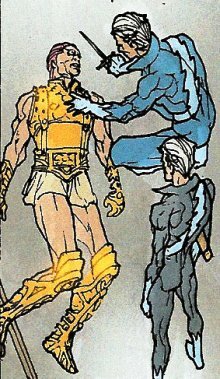 While trailing Quicksilver, who was delivering a gift to his daughter Luna, Goran apologized, stating it was his duty to do so. Goran stood outside, but Quicksilver and Luna were able to escape with the aid of Lockjaw. (Son of M#4) - Goran watched with Black Bolt, Karnak, and Medusa as Crystal tried questioning Lockjaw, but the dog teleported away. Videmus of the Genetics Council summoned the Maledicta brothers away from their post briefly, but Goran refused to stay long, rushing back to his guarding. Videmus took the other Maledicta brothers before the Royal Family, instructing him to arrest Videmus. (Son of M#3) - Quicksilver snuck into the cavern and, when Goran saw him, stabbed Goran through, killing him. (Son of M#4) - The other Brothers, with Videmus and the Royal Family, found Goran’s body and discovered some of the Crystals missing. With them missing, no Terrigenesis would be able to take place. Jolen revealed that the thief was Quicksilver. Comments: Created by David Hine and Allan Martinez. (Son of M#4) - Goran watched with Black Bolt, Karnak, and Medusa as Crystal tried questioning Lockjaw, but the dog teleported away. Videmus of the Genetics Council summoned the Maledicta brothers away from their post briefly, but Goran refused to stay long, rushing back to his guarding. Videmus took the other Maledicta brothers before the Royal Family, instructing him to arrest Videmus. The other Brothers, with Videmus and the Royal Family, found Goran’s body and discovered some of the Crystals missing. With them missing, no Terrigenesis would be able to take place. Jolen revealed that the thief was Quicksilver.